We pride ourselves on our ability to custom create all our cabinetry. We work closely with you the customer to come up with a layout and colour scheme that suits you best. To ensure you're comfortable with your choices before production begins we now offer 3D visualisations of your project. Bathrooms are a personal space ​​some of us spend a lot of time in. When helping customers design their cabinetry we take into account the two most important aspects: space and functionality. We offer a variety of options however if you have your own design in mind please feel free to discuss it with us. The laundry is a low-key vital room that requires a functional and practical layout. With 30 years of experience in the industry we can proudly say we know what works. We stay up to date with all the current trends and technology best suited to the requirements of a wet area. .We understand how important BBQ areas are to our fellow Australians that's why we take alfresco areas very seriously. We are up to date with all the required finishes, newest hardware technology and the best layouts to ensure the entertainer and guests are as happy as can be whilst they throw another shrimp on the barbie. From free standing to built in, we can cater to any bedroom wardrobes needs. We don't just limit ourselves to wardrobes we can also create storage units, bedside tables, tall boys, dressing tables, chest of drawers wall shelves, you need it, we can create it! Feel free to come past and visit out show room for more information. Our one-on-one handling of each job makes the whole design, build process flow easier and dare we say, even enjoyable. Centurion Cabinets caters for whatever method of design you choose, we have the facilities to design from the beginning or we can work from supplied plans/designs from your choice of designer/architect. We understand that building or renovating a room in your house can be quite nerve wrecking and overwhelming and that is where we step in to help. 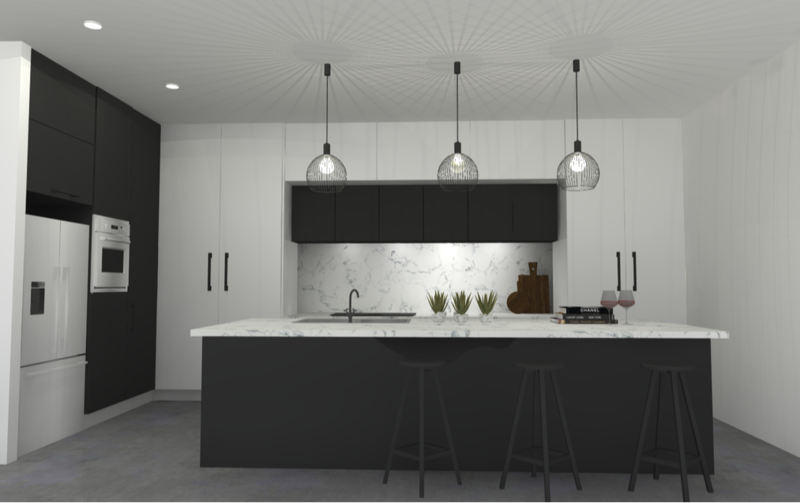 We now offer 3D renders of your space, to scale with your selected finishes so you can get and insight into what you have chosen to see if it works. This can be done before production starts so if changes need to be made you save yourself from costly variations. With all of our projects being custom made means we can proudly say we can cater to everyone's needs. We work along side you or your chosen designer to come up with the best possible outcome for your space. We take into consideration the layout, current trends, appropriate finishes, new technologies and special requirements for your design. We can work off supplied plans or we can supply plans for you through our in house interior designer. Please book an appointment to come in and see our showroom. We push to be as environmentally friendly as we can possibly be, our CNC router optimizes cutting to ensure we have as little waste as possible, we have installed solar panels to our production shop and we use FSC approved board.